The spirit’s masculine or feminine counterpart conceived out of the same white fire body, the fiery ovoid of the I AM Presence. Each set of twin flames is created out of the same White Fire Body by the Father-Mother God, Elohim, in the heart of the Great Central Sun. Within this single fiery ovoid, which is God, twin flames evolve their God-Identity by cycling through the concentric spheres of the causal body, which surrounds the White Fire Body. The White Fire Body divides into two identical spheres, each consisting of the I AM Presence surrounded by the causal body. One of these twin spheres is charged with the masculine polarity and the other with the feminine polarity of the Divine Whole, yet each Divine Monad contains within itself the plus/minus polarity of the T’ai Chi and is androgynous. The I AM Presence of each one then sends forth the soul of the twin flame. For the purposes of the incarnation and evolution of twin flames, the two souls are in polarity to each other, one representing the masculine and the other the feminine half of the Divine Whole. These souls created by Elohim in the beginning, and joined together again in the ending, go out into the Matter universes to take incarnation for the purpose of fulfilling the divine plan of their twin flames. 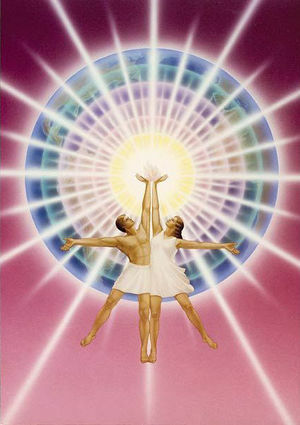 As divine counterparts who are created from the same White Fire Body, twin flames share a unique electronic blueprint which none other will ever have; likewise their cosmic destiny is unique and none can fulfill it in their place. Elizabeth Clare Prophet, Soul Mates and Twin Flames: The Spiritual Dimension of Love and Relationships. Pearls of Wisdom, vol. 32, no. 37, September 10, 1989. This page was last modified on 29 June 2016, at 13:34.